Improved silage quality means less purchased feed, healthier cows and higher profits. Reduce spoilage and make the most out of your bunker space or silage pile with Agromatic's Big Foot Forage Packer! Andrew Rickert of Wisconsin says, "the Big Foot is a must-have during our harvest routine." The Big Foot is available in five different sizes ranging from 3,680 to 14,510 pounds making it ideal for any size operation. When fully loaded, it provides over 50 psi pressure per roller to pack the feed thoroughly and efficiently. Andrew Rickert of Eldorado, Wisconsin is in his 4th year using the Big Foot Forage Packer. Rickert says, "the Big Foot gives us better compaction than other packers we've used. We get a nice, solid pack and are able to fit more feed in our bunkers. We are bringing in semi after semi of silage and the packer is a necessity to sustain proper density." 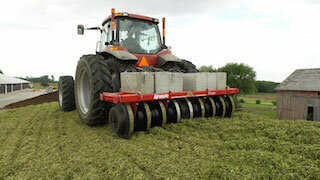 Agromatic has been marketing Silage Packers for several years but we continually incorporate improvements such as an integrated stand to allow level hitching, bearings that can be replaced without removing wheels, and an automatic lubricating system. All models are equipped with a standard Category 3N/3 hitch.